Students share reasons for supporting collaborative co-teaching strategies at Stone Scholastic Academy. Move toward a more inclusive environment for our special student populations. Co-Teaching: A presentation of the Illinois Professional Teaching Standards, particularly Standard 8-Collaborative relationships: “the competent teacher builds and maintains collaborative relationships to foster cognitive, linguistic, physical, and social/emotional development. This teacher works as a team member with professional colleagues, students, parents or guardians, and community members.” Included were common Co-Teaching Models, Team Teaching key concerns and a Co-Teaching Checklist. Neurology of Learning: Brain-based Applications and types of learners: concrete, abstract and reflective. Executive Functioning and Organizational skills: focusing on planning, emotional control, attention, self-monitoring, organization and the working memory. Accommodations and Modifications: definition and examples of each. Included in this session were the characteristics of various disabilities and matching instructional strategies. (2) digging deeper into what successful Co-teaching is and how/when to use various models. We purchased several copies of Dr. Marilyn Friend’s publication, “Co-Teach! 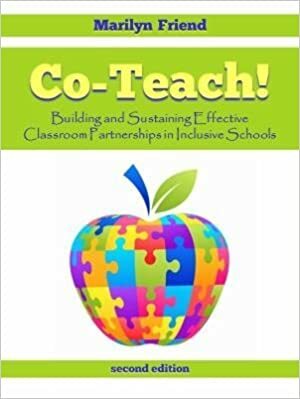 Building and Sustaining Effective Classroom Partnerships in Inclusive Schools.” We formed a book club, broke down chapters and held discussions related to the content. (Meetings were held on 10/20/14, 10/27/14, 11/19/14, and 4/6/15). In addition to our book club, on January 16, 2015, 9 teachers were sent to the Dr. Marilyn Friend’s workshop: “Best Practices in Co-Teaching.” Both grant and local funding were utilized. Teachers were sent as partners in an effort to strengthen their professional bond. They learned first-hand the components and intricacies of Co-Teaching, and had a bit of experience working with different models so that they could be more effective. As Co-teaching is a new strategy to this school, it was important for teachers to feel supported, yet not threatened. It was felt that teachers should have the autonomy to work with the strategies and would benefit from a mentor or coach. They needed to be able to be observed and receive feedback on their progress and performance, without this being used toward their professional evaluation. Dr. Meg Carroll was commissioned to do this work. She visited the school on numerous occasions (10/20/14, 12/15/14, 1/29/15, 4/6/15, and 4/20/15) to observe teachers and teacher teams, discuss, document and provide critical feedback. Throughout the year, the project team needed to enlist the assistance of substitute teachers and also provide extended day opportunities for teachers to work together, both of which were utilized. This time was used to have teachers observe colleagues within the cohort, provide feedback and have professional conversations. Teachers also began to work on lesson planning together. As time passed, and they were able to work together as one generalist and a specialist, and we agreed it would make sense to look at an entire year’s curriculum. A couple years ago, Stone teachers began work on curriculum mapping, but the task never fully developed. Now, with newly learned instructional strategies and stronger relationships, teachers decided to revisit that activity. Fortunately, Dr. Carroll has experience in curriculum mapping, and provided guidance to teams of teachers as they worked together to develop grade level curriculum maps which concentrate on the areas of literacy and math. Once curriculum maps were complete for a grade level, the plan was to then meet as a team to look at vertical alignment so that the end product would be complete and cohesive for grades K-8. From there, they can begin to delve into examining and creating effective student assessments. At the end of the 2013-2014 academic year, Stone was cited by the State of Illinois regarding student placement of students with disabilities. The school houses 629 students, with roughly 12% of our students receiving special education services. Once notified, our special education team met with administration and outlined a plan to correct these measures. We collaborated, and through teacher discussion, we identified a small group of students who could perhaps benefit from receiving instruction in a more inclusive environment. Parents were consulted, IEP meetings were reconvened, and the internal structure was adjusted so that more Co-teaching environments were made available. Co-teaching helped us be successfully removed from the state’s Focused Monitoring after only one year, as opposed the customary two year process. I like having two teachers because we can learn from two different ways. I’d say having two teachers is good due to the fact that if there’s a long line for one, the other is able to help you. I like having two teachers because all of the stress is not on one teacher. I enjoy having more than one teacher around because if we had one teacher and 32 students, the teacher would be yelling A LOT! I like having two teachers because if you asked one and you didn’t understand it, you can ask the other. Teacher’s comments related to co-teaching express positive aspects as well. One teacher commented “the best results have been having the opportunity to give the students two ways to look at solving problems. Because my co-teacher has a background in Special Education, she naturally uses ways to explain the concepts in a more concrete way, for example, drawing pictures on the board. etc. “ They also said there is less stigma for children and professionals use a common language. Teachers stated they are able to do more small group work, and feel they are better supported. They also say they have developed a greater professional respect for colleagues because they learn from the others’ expertise and find out what each brings to the table. They illustrated their Co-Teaching experience by creating the attached display which they proudly placed in the staff lounge which was the only available space due to overcrowding. The most significant challenges we faced this first year was to find time for teachers to meet. Since we are now on a longer school day, our regular day starts at 8:00 a.m. and ends at 3:00 p.m. For a good portion of the school year, many teachers also work an extended day program for some part of the week, as approximately one half of our children attend the After School All Stars program from 3:00 until 4:15 p.m. Teachers were accommodated by giving them a choice of being provided a substitute teacher, or earning an extended day stipend. Teachers are also concerned they will have to change partners every year due to different assignments or staff leaving. Fortunately the staff at Stone is relatively stable, and administration is making a commitment to keeping as many positive teaching partners intact as possible in the upcoming year. Grading is another area of concern. Teachers must have time to discuss individual student progress and agree on a fair and equitable grading system. Finally, there is one teacher who is still showing reluctance to “let go” and collaborate. Offers continue to be extended to her to participate in discussions and administration is working with her to lessen her concerns. It is my hope that giving this teacher time, and keeping her exposed to her co-teaching colleagues, she will see the added benefits to utilizing this model. This entry was posted in Academic Enrichment and tagged arts integration, dramatic play, early childhood education, stem, washington DC.